In May 2012 Magick Eye founder, Chris Hillman, wandered into the Magical Sounds dance tent at the Bearded Theory Festival and was met by some wonderful dub and trance sounds coming from the stage. The band creating these aural pleasures was called 'Spacehopper' a three piece outfit that looked great too, all wearing their eye catching Spacehopper logo t-shirts. Chris went back to his tent at the festival only to find that he was camping next to the Spacehopper crew. Conversations started and he found that not only were they good musicians they were also a great bunch of people. So in early 2013 when Chris decided the time was right for some new Magick Eye music he thought Spacehopper would be an excellent addition to the Magick Eye family. So here it is! 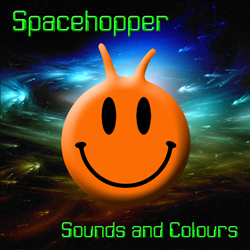 Spacehopper's first single, 'Sounds and Colours', three mixes showcasing their uplifting trance and dub sound. Spacehopper was formed by Chris Spacehopper who pushes machines to extremes, using synthesisers, computers and machines to produce the core sound. Paul Spacehopper adds his rhythmic percussive skills whilst Phil Spacehopper adds some driving bass and guitar overlays. Spacehopper will be playing at gigs, parties and festivals during 2013 as well as recording tracks for their first album.